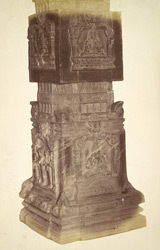 Photograph of a column of the Hazara Ramachandra Temple at Vijayanagara, from the Archaeological Survey of India Collections, c.1880. Vijayanagara was founded on the bank of the Tungabhadra River in the 14th century and was the most powerful Hindu kingdom in Southern India until the defeat by the Muslim armies in 1565. The Ramachandra Temple is situated in the royal centre and dates from the 15th century. It used to be the state chapel of the Vijayanagara rulers. The main temple, set in the centre of a rectangular compound, is richly carved with reliefs depicting royal scenes and scenes from the Ramayana epic. The columns of the inner mandapa (as seen in this view) are made of basalt and are carved with different aspects of Vishnu.